This is a story about love, and about consent. It’s one of those fantasy novels that uses its fantastical elements to emphasize real-world issues and turn them hyper-real, which is one of my favorite things the genre can do. It’s an exceedingly disturbing book at times, not only due to the creepy magical imagery but because it explores how sometimes even the people who love you the most can do terrible things to you. Never-Contented Things is the story of Ksenia and Josh, foster siblings with trauma in their past who love each other more than anything, and also of their best friend Lexi, who Ksenia has never truly let in the way she wants to. Ksenia, the older sibling, knows that Josh has come to love her in a more-than-brotherly way, but their more immediate problem is their impending separation as Ksenia is about to turn eighteen. Before this can happen, however, their entire reality shifts after the introduction of a group of frighteningly beautiful strangers appears one night at the gorge. I really don’t want to give much away about the plot; I think this is a book where it’s better to let things unfold slowly, because it enhances the disturbing qualities of what in many ways reads like a very dark fairy tale. It’s beautifully written, with a continuous battle between describing the inhuman and unreal things happening and allowing the reader to realize along with the characters that some of what they’re seeing is too difficult for a rational mind to perceive. It feels like a dream and a nightmare, and I’d highly recommend it to readers of dark fantasy, dark fairytale retellings, and anyone looking for a story to get lost in. 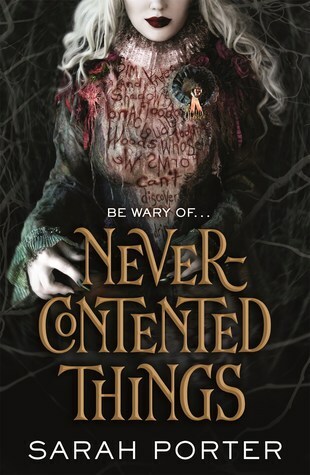 I received an eARC of Never-Contented Things from NetGalley.